During my most recent pregnancy I made a pregnancy belly butter and it was absolutely wonderful. Not only was it all natural and void of any scary chemicals (hello! growing a baby here…) but it left my skin smooth, soft and alleviated my stretched and irritated skin. Shea butter, the main ingredient, is a skin superfood that comes from the seeds of the fruit of the Shea tree. My favorite thing about shea butter is that provides the skin with essential fatty acids and the nutrients necessary for collagen production. Spending the time to make quality skincare products like this is a simple way to take care of YOU. And it’s actually not that complicated or time consuming. I bought all my ingredients here. I really like Mountain Rose Herbs’ essential oils. 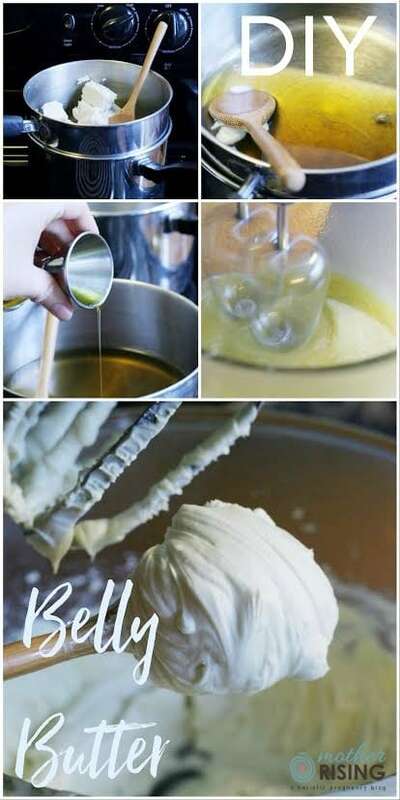 Melt the butter using a double boiler. If you don’t have a double boiler you can rig up some sort of pot contraption like I did. It works. 2. Add the carrier oil. Use a jigger. Because that’s all you got. 3. Remove from heat and bring to room temperature. I am an impatient person and use my fridge and/or freezer to quicken this process. If you do this, set a timer so that you don’t forget and it doesn’t get too chilled. It will get hard quicker than you think! 4. Add essential oils. Lavender and orange are nice because they blend well together and they’re safe for pregnancy (and babies too). See how it’s getting more opaque? The mixture is hardening as it cools and is whipped. When you’re done it should look like delicious frosting and be very thick. Congratulations! You created an amazing pregnancy belly butter that you and your baby will enjoy! PS – I store my finished product in mason jars. This should have a shelf life of about a year depending on what carrier oil you chose. Made some belly balm with lavender and orange essential oils. Thanks @carli_marchelle for the text support! So maybe I did this wrong. When I diluted the essential oil was I supposed to only add 25 drops from that or all of the carrier oil with the essential oil in it?